The Volvo CCI3* Bromont Three Day Event, The Todd Sandler Challenge, was the last North American qualifying competition leading up to the 2012 London Olympic Games. Held in Bromont, QC, on June 7-10, 2012, Canadian riders, led by 2010 World Equestrian Games (WEG) team member Rebecca Howard of Salmon Arm, BC, posted great results while earning qualifying results for the upcoming Games. Coming off a win in the CIC 3* Jersey Fresh weeks before, Rebecca Howard and Riddle Master, Blithe Hill Farm’s 11-year-old Canadian Sport Horse gelding, placed fifth in the new CIC 3* division, which was added this year at the request of the Canadian and United States Eventing Team selectors for Olympic selection and training purposes. The pair was tied for 22nd place following dressage with a score of 54.60. A clear cross country ride with eight time penalties over Derek Di Grazia’s challenging cross country course and a fault-free show jumping round, allowed Howard to finish on a score of 62.60. The CIC 3* division was won by American Karen O’Connor and Mr. Medicott. The top Canadian in the CCI 2* division was Diana Burnett of Blackstock, ON, riding Diamond Cut II, a nine-year-old Irish Thoroughbred gelding owned by the rider and the Diamond Syndicate. Sitting in sixth place after dressage on a score of 52.20, the pair added only 0.8 cross country time penalties and a rail, for four faults, in the jumping round to finish with a score of 57.00, which was good for sixth place out of 42 starters. Finishing in ninth place and adding 11.60 cross country time penalties to their dressage score of 53.30,was Canadian Olympian Selena O’Hanlon of Kingston, ON, and her Pan American Games partner Foxwood High, John Rumble’s nine-year-old Canadian Sport Horse gelding, who finished with a score of 64.90. The CCI 2* division was also won by O’Connor and Mandiba. Hawley Bennett-Awad of Langley, BC and De Mello, Megan Lepper’s eight-year-old Oldenburg gelding, added only four jumping faults to their dressage score of 48.80 to finish with a score of 52.80 for fourth place in the CCI 1* division out of 56 entries. Wewiora and her second mount, Prince Mayo, Bernhard’s seven-year-old Irish Sport Horse gelding, added eight cross country time faults to her dressage score of 46.90 to finish in sixth place with a score of 54.90. Riding her own nine-year-old Canadian Sport Horse, Chatsworth, Penny Rowland of Orangeville, ON, finished in eighth place with a score of 56.90. In ninth place was Jordan McDonald of Oakville, ON, riding Glencento, a seven-year-old Irish Sport Horse mare also owned by Bernhard, with a score of 57.80. Kelli McMullen-Temple and her own Calero, a seven-year-old Holsteiner mare, finished the CCI 1* in 10th place, scoring 58.10. In 11th place was Haley Armstrong-Laframboise riding Steven Chepa’s 12-year-old Trakehner mare, with a score of 58.50, while Katherine Martineau of Brossard, QC, rounded out the top 12 riding her own H.M. As Spirits Go, a 14-year-old Irish Sport Horse gelding, with 58.90. American Buck Davidson won the CCI1* division riding Copper Beach. The Volvo CCI3* Bromont Three Day Event proudly hosts The Todd Sandler Challenge in memory of an aspiring young event rider, Todd Sandler of Dollard des Ormeaux, QC. Todd at the age of 18 died tragically in a car accident on April 26, 1999 while returning home from the Rolex Kentucky Three Day Event. 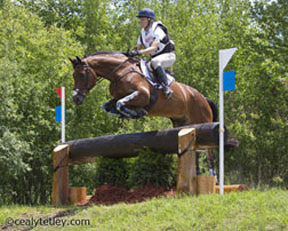 He was one of Canada’s best eventing prospects.